The vessel, of 133 meters overall length, has the largest crane ever installed in a Shipyard in Vigo. Vigo, 20th of April, 2012.- The Shipyard METALSHIPS & DOCKS from Vigo delivered a offshore vessel this afternoon the owners McDermott (United States) and Oceanteam (Holland). The two maximum representatives of both these multinational companies signed the delivery of the vessel this afternoon, along with the President of Metalships & Docks, Manuel Rodríguez, during a Ceremony with other spanish government authorities present such as the President of Xunta de Galica, Alberto Núñez Feijoo; the major of Vigo, Abel Caballero, and the Economical and Industrial MP, Javier Guerra, amongst others. 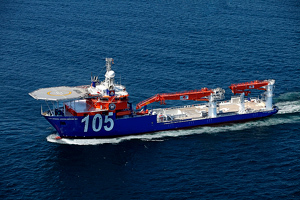 The Lay Vessel North Ocean 105 has an overall length of 133 meters, 27 meters of beam and 9,70 meters depth. This vessel especially stands out for its two cranes, of 400 Tons, the biggest ever installed to this day, in a Shipyard in Vigo and another one of 150 Tons. It also stands out for the capacity it has to lay rigid pipelines as deep as 1.500 meters. The Lay Vessel North Ocean is prepared to accommodate a crew of 120 people. During the delivery ceremony, the President of Metalships expressed his satisfaction for having concluded the seventh offshore vessel built at the Shipyard a type of vessel which the shipyard has specialized in. This is not the first time that Metalships works for these two multinational companies, which indicates the yards position in international market. This same year the vessel North Sea Giant, also built at Metalships & Docks and delivered in 2011, was awarded the prize Offshore Support Vessel of the Year by the London Editorial The Offshore Support Journal. The Lay Vessel North Ocean 105 will be working worldwide mainly as pipe-layer although she can develop other offshore tasks. Its first destination will be France where the reel and the equipment to enable it to lay the pipelines will be installed on the vessel, this operation which the owner will carry out, will take two months. From here, the vessel will continue to Southeast Asia where various services have already been contracted.